Strange And Cool. : Dancing Alien Mortgage Company Ad? Dancing Alien Mortgage Company Ad? 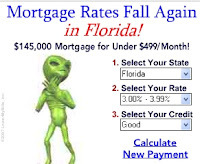 I saw this mortgage company ad today and there was an alien doing a little dance and clapping his hands! What the heck is this? What are they trying to say here? Why is the alien clapping his hands like he's happy? Is he glad that mortgage rates are falling in Florida? Oh NOW I get it!!! They're saying that alot of Aliens live in Florida. LoL :-) So now the Aliens are happy because it's cheaper for them to buy a house here. I guess they lost their Flying Saucers. But why did they pick Florida to settle down in? If I was an Alien and I lost my Flying Saucer I wouldn't pick Florida because there are too many Aliens here. Thats too funny, that would be my guess too about the aliens, but really I don't think too many people would pick up on that. 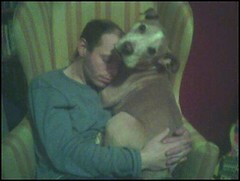 especially the older people who are looking to buy a house and retire. You know what? I think I saw that one too and completly ignored it. What's wrong with me? And what's the thing s/he's doing with the hands? Is that some kind of Illuminati sign? Is this ad just a way for the Illuminati to communicate with each other? I was thinking the same thing about the illuminati sign. I don't think they would need to use such a primitive means to communicate though. Most importantly: What is that dance? Surely someone can name it.